Fancy winning a share of £25,000 in cash? 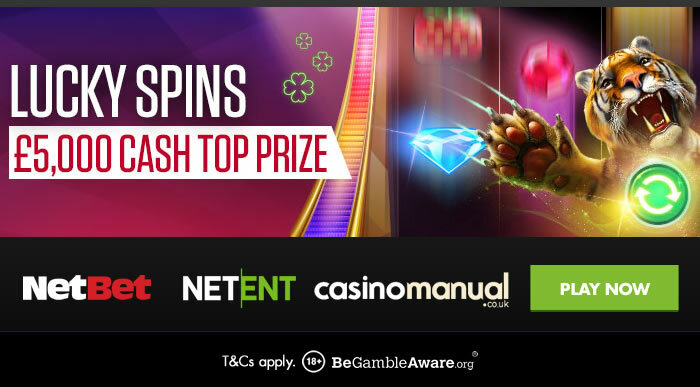 Well, NetBet Casino are giving you the chance to win up to £5,000 in cash! The Lucky Spins promotion runs from today until Sunday the 18th of March (2018) – you need to play any of the 3 eligible video slots from Net Entertainment with 1 entry awarded for every £10 you stake. The more prize draw tickets you amass, the higher your chances of winning 1 of 1,500 cash prizes – there’s up to 50 tickets to earn per day. Once the promotion has ended, 1,500 players will win a share of £25,000 in cash – players finishing in 4th to 1,500th place will each win £10 in cash. If you come 3rd, you’ll take home £1,530. If you finish runner up, you’ll win a cool £3,500 in cash. If you land top spot, £5,000 in cash will be heading your way! In terms of the eligible video slots, they include Dazzle Me, Reel Rush and Jungle Spirit: Call of the Wild – the latter is recommended and comes with 5 reels and 243 ways to win. Available to play from 20p a spin on all devices, you are taken to an extremely volatile jungle. It comes with a Symbol Expansion feature where symbols part of a win expand to take over the whole reel. It also benefits from a Butterfly Boost feature where you see butterflies expand up to 5 symbols for big wins. It’s all about the Free Spins feature though where you choose from 5 different animal options. You can choose from as many as 20 free spins but I would go for 4 free spins with the tiger as you can win up to 7,678 times your total bet on every free spin!